You get used to being the odd man out, and seeing odd things. I don’t think I’ve ever become jaded by travel, but I think it takes a bit more to make me awestruck, to register on my sense of wonder meter. So I was thrilled and honored to travel with students from West Texas A&M to Honduras. Seeing them seeing the world for the first time was definitely one of my 2012 highlights. It was a great way to kick off a year of traveling that would also take me to Costa Rica, Peru, Colombia, Ivory Coast, Ghana, Burkina Faso, Morocco, and China. They reminded me why I love to travel and helped to rekindle my fascination with the world and its people. I enjoyed the experience so much I partnered with The Village Experience — a socially responsible tour company – to offer other such trips to groups. In May I’m traveling with students from Winthrop University to Guatemala. I can’t wait! 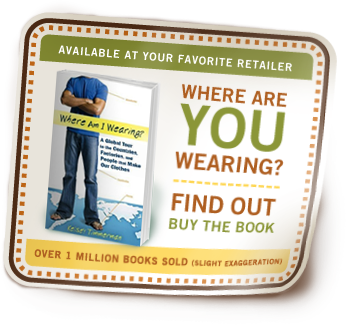 Learn more about going on a WHERE AM I WEARING or EATING themed trip. So far Guatemala is my only planned trip abroad, which is good because I want to be gone less in 2013. The world is big and there are a lot of stories that need telling. I aim to tell as many as possible.